This high quality hydraulic gauge is intended for permanent fitting into machines and installations of all kinds. 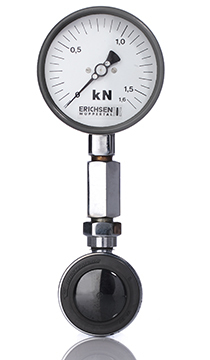 Due to its durable and robust construction, this hydraulic force gauge from Erichsen Wuppertal is highly suitable for rough operating conditions on permanent machines and installations. The 332 model is supplied with a precise pressure gauge of 100 mm nominal diameter with zero point correction. A wide range of accessories are available to cover most applications. Request more information to see how we can help you with a force measurement solution that suits your need. See our Force Measurement Catalogue here.